In the spring of 1984, a strange new comic book sat beside cash registers in select shops, too big to fit in the racks, and too weird to ignore. Eastman and Laird’s Teenage Mutant Ninja Turtles presented a completely original breed of super heroes. It was too bizarre, too crazy. It broke all the rules and should never have worked. Until it sold out. Again and again and again. Just as the franchise hits movie screens for the first time in seven years, we find a new documentary about the Teenage Mutant Ninja Turtles. 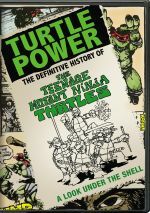 Called Turtle Power, it purports to give us “the definitive history” of the series. Power does so with a standard mix of interviews and archival footage. In the former realm, we get comments from Silver Snail manager Mark Askwith, Raise Some Shell author Richard Rosenbaum, TMNT creators Peter Laird and Kevin Eastman, Mirage Studios artists Jim Lawson, Ryan Brown, Michael Dooney and Steve Lavigne, Surge Licensing’s Mark Freedman, Playmates Toys’ John Handy and Karl Aaronian, animation producer Fred Wolf, screenwriter David Wise, original toy sculptor Steve Varner, actors Barry Gordon, Rob Paulson, Michael Ian Black, Robert Ben Garant, Cam Clarke, Ranae Jacobs, Townsend Coleman, James Avery, Pat Fraley, Judith Hoag, Michael Turney, Kevin Clash, and Peter Renaday, producer Thomas Gray, story writer Bobby Herbeck, director Steve Barron, production designer Roy Forge Smith, Jim Henson Company’s Brian Henson, Michaelangelo suit performer Michelan Sisti, stunt performer Ernie Reyes, Jr., 4Kids supervising producer Lloyd Goldfine, fans Austin Gibson, Stephan Reese, Charles Knauf, Michele Ivey, and Dereck Seltzor, comic artists Mark Bode and Ross Campbell, The Totally Rad Show’s Dan Trachtenberg, Alex Albrecht and Jeff Cannata, comic writer Doug Brammer, and Mirage CEO Steve Richardson. The show traces the origins of the TMNT and how they came to the comic pages as well as aspects of character/narrative areas and the nature of the earliest TMNT mags, artwork and visual choices. We also hear about the growth of Mirage Studios, the expansion of the franchise and its move to the mainstream, merchandising and the animated TV show, the 1990s movies, and continued developments over the years. Normally documentaries like this favor the early years of a franchise far above all else. For instance, The Alien Saga devoted about 45 percent of its running time to the first effort in that series. That can be frustrating for the viewer, as these programs tend to rush through subsequent projects too quickly and lack depth/balance. With Power, we tend toward the opposite issue, as it gives us far too little information about the TMNT franchise’s formative years. We get basics about the Eastman/Laird partnership and their creation of the comics, but the show speeds through these topics way too quickly. Because of this, it feels like the paint hasn’t dried before Power digs into the animated series and subsequent spin-offs. I realize that in terms of chronology, all that happened pretty quickly. The animated series hit screens only three years after the comic book debuted, so Eastman/Laird didn’t have a ton of time to grow their characters before others worked on them. Still, I feel like we hear too little about the “early years”. I hoped for thoughts about the characters and stories that I didn’t get, as the show seemed much more interested in the franchise’s later developments than in its roots. To some degree, that makes sense, as I suspect the TMNT TV shows and movies reached a much higher numbers of fans than the comics ever did. Usually the project that brings a property to prominence remains the dominant medium; for instance, even with all the merchandising, TV specials and movies, the Peanuts comic strip stayed the focus of the franchise. TMNT seems different, and I’d bet that many fans never read the comics – indeed, some may never know the Turtles started in comic form. Because of that, I understand the emphasis on animation, toys and movies. Sort of. While I can intellectualize the less than stellar discussion of the series’ early years, I still feel Power needs to get into those elements in a deeper manner. When it shifted to spin-offs, I thought “already?” I couldn’t believe that the program was ready to move onto different areas so soon. As a 99-minute documentary, Power just doesn’t have enough time to investigate all the various realms in a satisfying manner, so it ultimately feels like a tease. We get passable notes on the different domains but not enough to feel like we really learned a lot about them. Each of the subjects probably could sustain a long documentary on their own, so the combination of so many in one place creates problems. It’s too bad Power couldn’t go the same way as the excellent Nightmare on Elm Street documentary Never Sleep Again. That one ate up four hours but never dragged, as it offered a thorough look at that franchise. If Power’s producers want to create a much longer cut, I’d love to see it. As it stands, Power does entertain despite its “Cliffs Notes” feel. I like the archival footage we see, and we find a mix of useful details along the way. I especially like the comments from actors Robert Ben Garant and Michael Ian Black; who knew those semi-famous performers started out in the cheesy TMNT stage show? I wind up moderately unsatisfied with Turtle Power, though, because of what it could have been. The documentary gets such good access to so many people at the core of the TMNT story that I want to hear more; the superficiality required to keep it under 100 minutes harms it in the end. 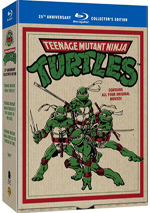 Turtle Power: The Definitive History of the Teenage Mutant Ninja Turtles appears in an aspect ratio of approximately 1.78:1; the image has been enhanced for 16X9 televisions. This was a generally bland presentation. Sharpness seemed erratic. The shots could look rough and blocky, but they generally appeared reasonably accurate and concise. Definition was never poor, but it was never particularly good, either. Light instances of jagged edges and shimmering occurred, and mild signs of edge enhancement could be seen. Source flaws weren’t an issue. Colors were mediocre. The program featured a natural palette, but the tones tended to be somewhat flat and undistinguished. Blacks were acceptable, and shadows showed decent delineation. Overall, this was a watchable image but not anything above average. I thought the Dolby Digital 5.1 soundtrack of Power was average for a documentary. As far as I could tell, speech and effects remained centered, but music spread to the side and rear speakers. It did so with reasonable breadth. Audio quality was fine for the most part. Speech lacked edginess and was always intelligible but came with an odd echo at times that could be a distraction. Music seemed full and rich, and effects were good; they didn’t demand much of the mix, but they appeared accurate enough. This was an acceptable track for a documentary of this sort. The disc opens with ad for Teenage Mutant Ninja Turtles (2014 movie), Transformers: Age of Extinction, Hercules and Teenage Mutant Ninja Turtles (Nickelodeon series). These also appear under Previews but the disc includes no other extras. While entertaining and occasionally insightful, Turtle Power: The Definitive History of the Teenage Mutant Ninja Turtles doesn’t live up to its title. The documentary rushes through its topics far too quickly to deliver a genuinely satisfying examination of the TMNT franchise. The DVD comes with average picture and audio and lacks any supplements. I’d love to see a much longer cut of the film, as this one leaves me disappointed.